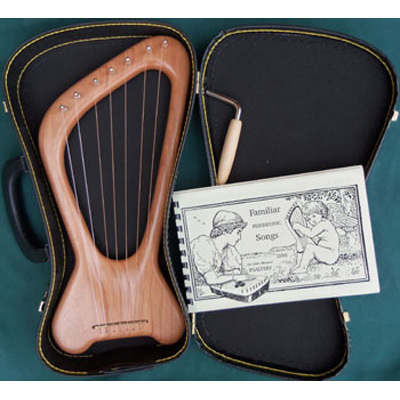 The Kinder Lyre comes with a songbook, tuning key, stringing information and case. This delicately sculpted instrument is designed for the younger age group and provides a wonderful first instrument. The 7 Pentatonic strings encompass the range of the child's voice and are gently stroked towards the heart. The Kinder Lyre is used extensively in the Steiner schools with the Kindergarten through 2nd grade children. It has a soft, ethereal tone, especially appropriate for the younger child who still lives in that dreamlike world. The Kinder Lyre comes with a songbook, tuning key, stringing information and case. Made in New Mexico by Harps of Lorien. "The Kinder Lyre, often called the Kinder Harp, is our simplest, most basic harp. It is being played to and by countless children and adults alike – from before birth, through infancy and childhood – all the way through to the last breath. There are no "wrong" notes on the Kinder Lyre. All the notes of the scale harmonize, so when any two or more are played together, they always sound pleasing. It is tuned to a Pentatonic or 5-note scale (D E G A B d e), a scale used extensively in folk music from around the world. That scale has a very soothing and relaxing sound, a very "Oriental" sound. In Waldorf Education, a system founded by Rudolf Steiner, who explored and taught about the spiritual effects of this scale on the young child, the Kinder Lyre is introduced in the 1st grade. Often schools will buy the instruments as unfinished kits and complete them as a project. 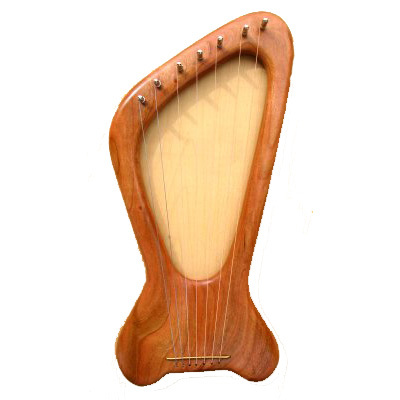 Many homeschooling families use the Kinder Lyre. Some make them from kits because they are so easy to learn and play.